Sometimes I don't post my ideas because I don't have a picture of it. I decided I need to just get these ideas out and not wait for the perfect picture every time. Here is an idea I have adjusted from the days in the classroom. When I sort through the newspaper or mail I like to save the grocery ads. Max and I will go through them and do different activities. Sometimes we go through each item in the ad -- if he likes the item to eat, he circles it. If he doesn't, he puts and X through it. Teaches great fine motor skill (pre-writing) and teaches critical thinking. Sometimes it becomes a look and find. Mommy: I am looking for something to drink that is yummy for breakfast with pancakes. Mommy: What would be something you can put on your bread to make a sandwich? Variations: Younger ones can just do labeling. Can you find the apples? Can you find the milk? What's that? (point to something and have them tell you). Older kids could be given four or five different colors and be told to circle all the things in a certain food group i.e. fruits and vegs with a certain color, each group being a different color. An older child could be given a certain amount of money and be told to "shop" in the ads for what they would like to buy for that week if they could. Have them find the best deal. You can tell them to circle all the foods they think are good for them and X out all the bad ones (then look over it together and discuss). Find all the foods that start with the letter B. Different colors for different meals - blue for breakfast, red for lunch, green for dinner, yellow for snacks.... what else???? I love this idea; thank you! I always have these around and I think my 3 year old will enjoy some of these ideas. We tried this yesterday and it went GREAT. I blogged about it (and got some cute pictures, too). Thanks so much for sharing such a great (free) idea! 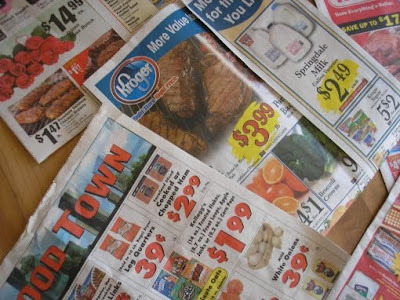 When I was a kid, my mom would get me more involved in grocery shopping by cutting and pasting pictures from the sales ads at home and bringing the "list" with us to the store. I think your ideas and my mom's strategy help do way more than what you've taken credit for! These tips can also foster more healthful eating and a child's part in the process. Kelsey, what a fun mom you must have! What an effort it must have taken but you are right , it teaches more than we even know. saw you on crafty crow. Like Kelsey, I let my kids cut out items and glue them on their own shopping lists. We don't usually buy everything on their lists, but they're allowed to scavenger for the items as long as they stay on the same aisle as me. It's been fun, and FREE!